Prohibitory orders were in place for the second consecutive day on Friday. Markets remained closed and buses avoided the Piro route to Ara and Sasaram. 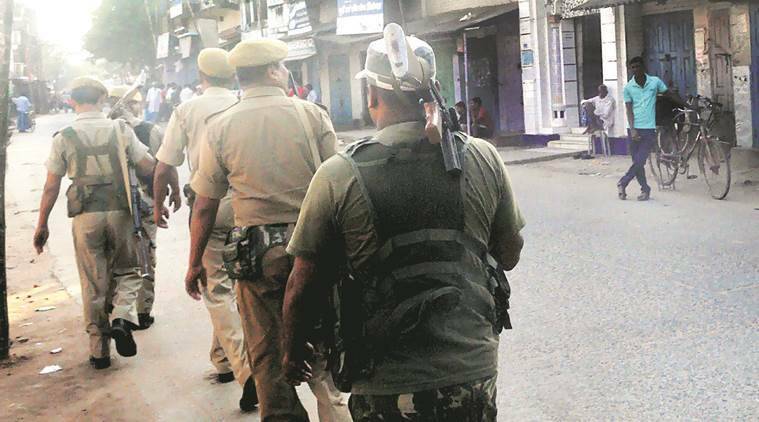 Twenty-one people have been arrested in connection with the communal tension at Piro in Bihar’s Bhojpur district. The district administration has deployed nearly 350 policemen at 15 sensitive points in the town. Internet services in the area remain suspended to prevent spreading of rumours. Prohibitory orders were in place for the second consecutive day on Friday. Markets remained closed and buses avoided the Piro route to Ara and Sasaram. More than a dozen people were injured in clashes in the area during immersion of Durga idols and Muharram processions in the past few days. Mobs torched about a dozen private vehicles on Thursday. Local residents said Bhojpur District Magistrate Birendra Prasad had played a crucial role in controlling the situation. Amid rumours that Muslim homes had been attacked, agitated people from the community were reportedly heading to a Hanuman temple when Prasad intervened, they added. An elderly resident claimed that rumours led to stone-pelting on processions. “Social media messages made matters worse,” he said. The politics of Piro has for long been dominated by former JD(U) MLA Sunil Pandey. Pandey lost to a CPI(ML) candidate in the last Assembly polls.